Alabama advances to the semi finals of the SEC tournament after upsetting the Gamecocks for the second time this year. -Once again we had a great defensive effort to start a game, but failed to take advantage of it. We held them scoreless for the first 4+ minutes, but only led 2-0. -The team showed a lot of fight and poise by not relinquishing the lead and getting big stops and baskets when necessary, despite not being able to put it away until late. - We were 15 of 21 at the free throw line, they were 13 of 23. It's nice to be on the positive side of that stat for a change. -Though he still scored 16, I thought we did a great job defensively on Thornwell. He never got into a rhythm. -Riley Norris was huge in the second half. -Donta had a solid game before fouling out. -I'm not sure I would have played Corban for 20 minutes, but overall I thought we did a good job with the substitution patterns to try to keep guys fresh. -Great game for Key with 18 points, and a solid effort from Ingram. In particular, I thought Ingram did a nice job of handling the pressure defense without making the bad turnovers he's been prone to. -Another great effort on the boards from everyone, especially Bola, who even finished around the rim a couple of times. -Crowd was about even, maybe a few more Bama fans there than South Carolina, but UK had at least three times as many as both teams combined. A lot of them stuck around after their game, but they seemed largely indifferent to the outcome. The ones sitting around me starting rooting for us, but lamented "neither one of these teams will play this bad tomorrow." There were a few obnoxious Tennessee fans sitting around me who were pulling against us. -I've said before that Nashville is a great location for this. It's centrally located, the arena is much nicer for basketball than the bigger football stadiums, lots to do around the arena, etc. That being said, I do have a couple of minor complaints. They didn't show a single replay on the jumbo tron. I can only assume the people running that are the same morons who work for their joke of a hockey franchise in this city. Also, traffic management is horrendous. It took me 20+ minutes to go half a mile from my parking deck to my hotel after the game. 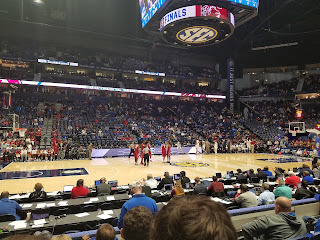 -Pro-tip: if you ever want to attend an SEC tournament game that happens to be the late game in Kentucky's session: wait till their game is over, buy cheap upper level tickets for half of face value outside from a scalper, and stand outside the portal leading to the 100 level and pester departing UK fans for their ticket stubs. The second guy I asked kindly gave his to me as they were leaving, and that's how I ended up with the view you see pictured above for 30 bucks. The UK fans sitting around me said they paid 250. Also, don't book your hotel in advance, fans of losing teams depart and hotels drop the prices. 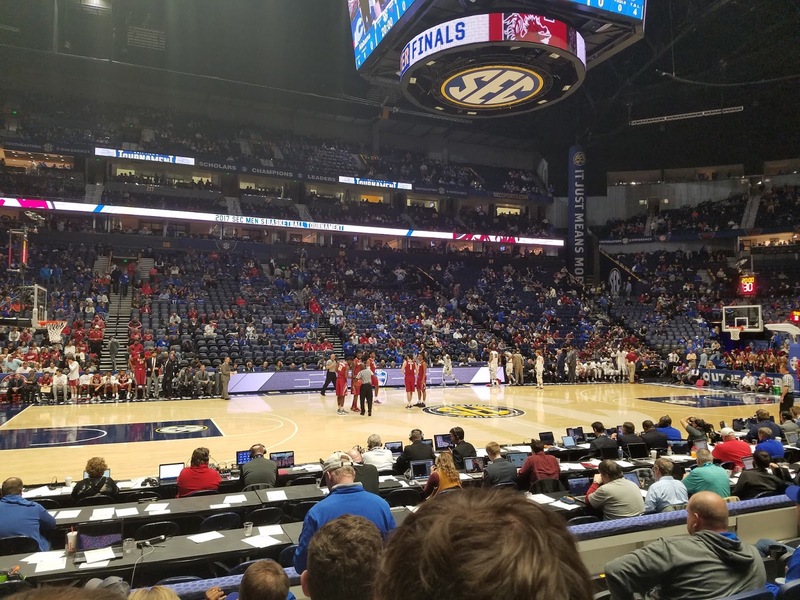 I cancelled one near Vandy due to the uncertainty of us winning Thursday, and ended up 2 blocks from the arena at almost a third of what I had originally booked for. -I'm hesitant to criticize the officials, but I thought they were terribly inconsistent. In fairness, that type of game is extremely difficult to officiate. -It was great to see the excitement in our guys at the end, and the Bama crowd was loud and appreciative. -Up next, the Kentucky Wildcats and Big Blue nation. It's going to be difficult, to say the least, but they aren't insurmountable. Nevertheless, it will take our best effort of the season and them having an off day for us to have a chance. Tip off is at noon. The dream is still alive, for now.